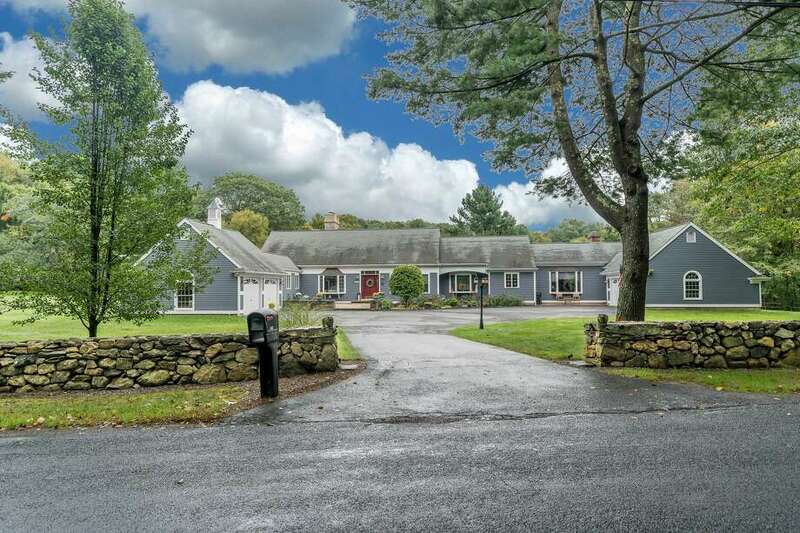 The contemporary Cape Cod-style house at 348 Staples Road is a recreational and leisurely paradise on a lake in Easton’s Aspetuck neighborhood. EASTON — Boredom will certainly never find the residents of the blue, contemporary Cape Cod-style house at 348 Staples Road in Easton’s Aspetuck neighborhood. This house is ideal, whether its next family is active in all sorts of recreational and sporting pursuits or whether they prefer a life of leisure relaxing lakeside and taking in the natural scenery. The house shares an unnamed lake or large pond with a handful of neighbors, and the three-acre property on which this house sits enjoys 270 feet of waterfront. The lake offers great water activities including swimming, fishing, row boating, kayaking and canoeing. Bird lovers will have a field day every day watching waterfowl gracefully glide across the lake, and song birds as they cut the air with their wings during feats or aerial acrobatics. Outdoor entertaining is not only easy, it is invited and encouraged because of this property’s two expansive wood decks. Several interior rooms flow nicely from inside to the outdoors. Attractive water views can be enjoyed from almost every one of this home’s 11 rooms. And it’s not just outside where there is so much to see. The house itself is quite interesting and appealing. The main part of the house is set back from the road, a fieldstone wall running along the front border of the property. There are two attached garages at either end, one of which is topped with a cupola and weathervane depicting a horse. This property does have a horse barn with a good size loft space that would work well as a music recording or artist studio or as a workout, yoga or meditation room. The positioning of the garages, each with two vehicle bays, creates a forecourt with ample parking for guests. One garage serves the main household while the other is designated for the occupants of the rather large in-law apartment, au pair suite, or guest quarters. The house features 6,940 square feet of living space arranged in a timeless layout, despite the construction date of the house, which goes back to 1992. This is a home for the modern era. It features a home theater or media room, a game room, and a large gym with a rubberized floor. And that’s just some of what is found in the full, partially finished basement. It also has a large office and tons of storage space. At the front entrance there is a wide apron of paving stones and a quarried stone wall, an alternative patio to the water side of the house. The front door is adorned with decorative leaded glass panes and framed by matching sidelights and a transom. It opens to the two-story foyer. The open floor plan allows for immediate water views as soon as someone walks through the front door. The living room features a stone fireplace, random width hardwood flooring, and French doors to one of the decks. It is open to the library. The sizable formal dining room has a bow window. In the eat-in kitchen there are custom cabinets, a long center island/breakfast bar, granite counters, stainless appliances, a five-burner induction range top, and breakfast nook. It opens to the sunny family room, which features a vaulted ceiling, skylights, a wall of windows and French doors to the larger deck. Also off the kitchen is a large mudroom, a large pantry, laundry room, and casual half bath. The more formal powder room is off the entrance foyer. This house features five bedrooms. Two are on the first floor — the master suite in the main house and the bedroom of the apartment. The other three are on the second floor of the main house. The master features two large closets and a renovated private bath. The apartment features a living room and eat-in kitchen with access to a deck. Should anyone want to wander off this site for other recreational activities, they don’t have to wander very far. Jump Hill Preserve, managed by the Aspetuck Land Trust, offers more than 2 miles of hiking and mountain biking trails at the north end of Trout Brook Valley. It also has proximity to the blue blaze Aspetuck Trail and the Connecticut Golf Club. There will be a public open house on March 31, from 1 to 3 p.m.